When I initially shared photos of the Creamy Vegan Cheddar Cheese Sauce on Facebook, some of my friends didn’t believe that it wasn’t real cheese. Then when I told them the dairy-free cheese was made from potatoes and carrots, they said it wasn’t possible. Some even turned up their noses. They didn’t believe that anything made from veggies could taste as good as real cheese. I get it. At first, I thought the same thing. When Brian and I first tried making the vegan cheddar cheese sauce, we were skeptical about what it would taste like. Even though I wanted it to taste amazing, I truly believed it’d be a bust and that I would be disappointed. The Creamy Vegan Cheddar Cheese Sauce was amazing. More than amazing. It was heaven. I ate it plain, right out of the Vitamix. I poured it over roasted broccoli and devoured it. I made the largest plate of nachos ever and ate it. And then my friends started asking questions. Could you use the vegan cheese sauce recipe to make Dairy-Free Broccoli Cheddar Soup? Could you use use the cheese sauce to make Dairy-Free Macaroni and Cheese? The minute they asked the questions, I knew I had to find out the answers. The first thing I made was the Vegan Broccoli Cheddar Soup. It wasn’t too hard to adapt the recipe and the whole family loved it. Next it was time to try making a dairy-free version of Macaroni and Cheese with the vegan cheese sauce recipe. And of course, my mac and cheese needed oven-cooked bacon! Holy Moly the Dairy-Free Bacon Macaroni and Cheese is, I think, the best thing I have eaten in a very long time. In fact, can you keep a secret? Shhhhh, don’t tell anyone… Other than the two small bowls of Bacon Macaroni And Cheese my daughter Natalie ate, I ate the entire 13×9″ casserole dish of this dairy-free Bacon Mac And Cheese. It has been years since I have eaten a delicious, creamy, macaroni and cheese, and after one bite of this recipe, I pretty much claimed the entire dish as mine alone. 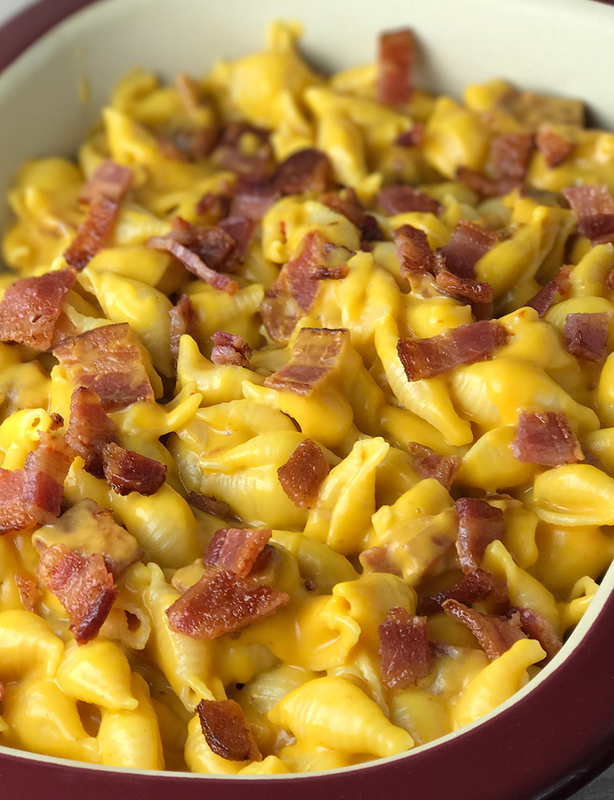 Now, trust me on this: while the Bacon Macaroni and Cheese tastes amazing when made fresh, it is even more amazing when reheated the next day, because as it sits in the refrigerator, the bacon flavor really gets into the pasta and makes the dish even tastier! I can’t tell you how happy I am to be able to eat macaroni and cheese again and not feel all gross and bloated from eating dairy. Hallelujah! If you want to try this recipe, but are allegric to nuts, make this nut-free by substituting 1/3 cup water for the Almond Milk. 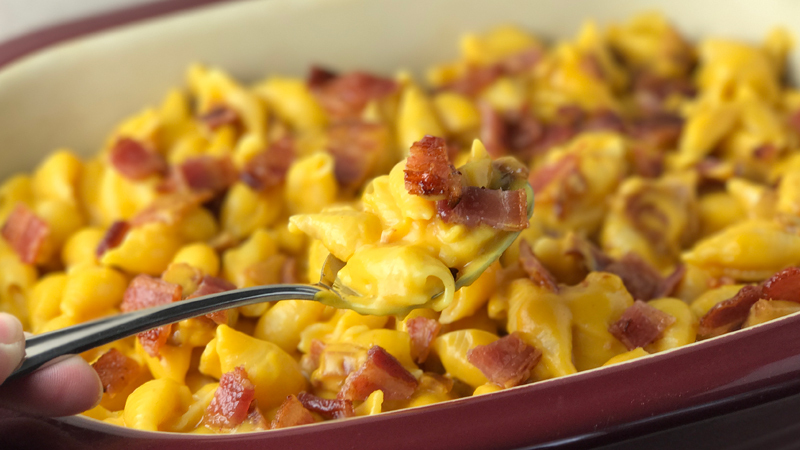 No one can take just one bite of this delicious, creamy macaroni and cheese recipe with oven-cooked bacon. Arrange bacon strips in a single layer on the backing sheets. It's okay if they are touching. Get as many strips on your sheet as you can, just make sure they don't overlap. Put the baking sheets in the oven and cook for 20 minutes. At the 15 minute mark, watch the bacon carefully — it will go from almost perfect, to burnt mess quickly. While the bacon is cooking in the oven, combine potato and carrot in a medium saucepan, cover with water, bring to a boil, and simmer for about 20 minutes, or until tender. Make the pasta of your choice, according to the directions on the package — we prefer medium shells. Remove the bacon from the oven, coarsely chop, and set it aside. To clean up the bacon mess, simply fold the foil into the center of each baking sheet, and roll it up into a ball, trapping the grease inside, and throw it away. Transfer the potatoes and carrots to a food processor. Add all other ingredients to the food processor and process for about 2 minutes, or until completely smooth. Combine the cooked pasta, the chopped bacon, and the cheese sauce, mixing it together until the pasta is coated completely in the cheese sauce. This Bacon Macaroni and Cheese tastes amazing when made fresh and more amazing when reheated the next day. The bacon flavor really gets into the pasta while it sits in the refrigerator! I used my Vitamix to make this Vegan Cheese Sauce, blending the ingredients on the soup setting to get the sauce nice and piping hot. Make this nut-free by substituting 1/3 cup water for the Almond Milk.